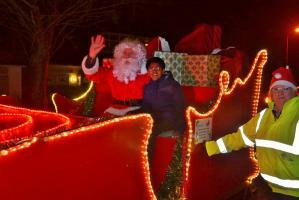 2014 marked the beginning of the new era of the traditional Christmas float touring the streets of Pinner, brought to you by the Rotary Club of Pinner with our newly built sleigh. 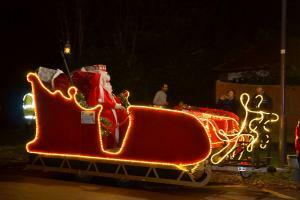 Popular with children and their parents, Santa's Sleigh has become an integral part of the Christmas festivities in Pinner. In 2018 we had our best year yet and raised over £4,400 for Alzheimer's Research UK our President's charity for the year, and other Rotary supported charities. 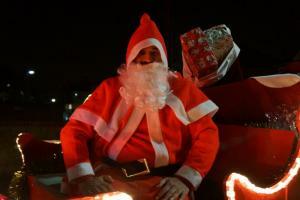 Why doesn't Santa's Sleigh visit our road? 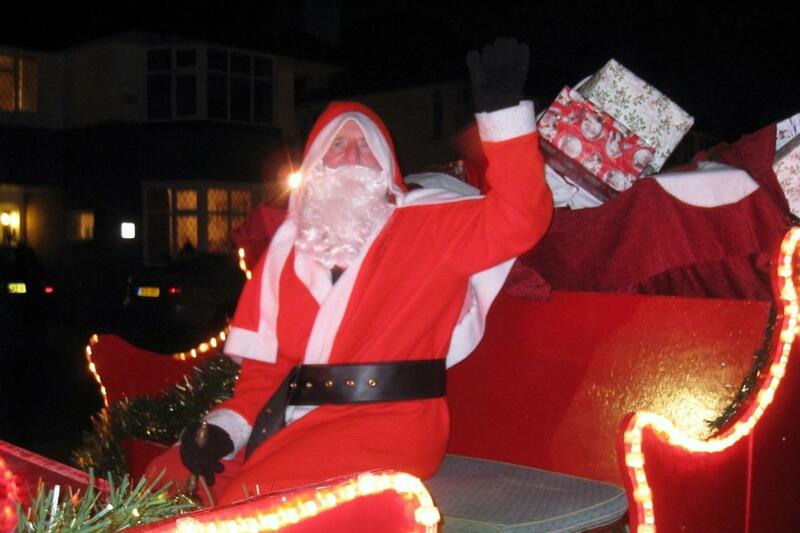 2014 was the first year that the Rotary Club of Pinner started touring the streets with Santa’s Sleigh. Although many residents remember a sleigh in their street years ago, that was probably either the Lions or Round Table. 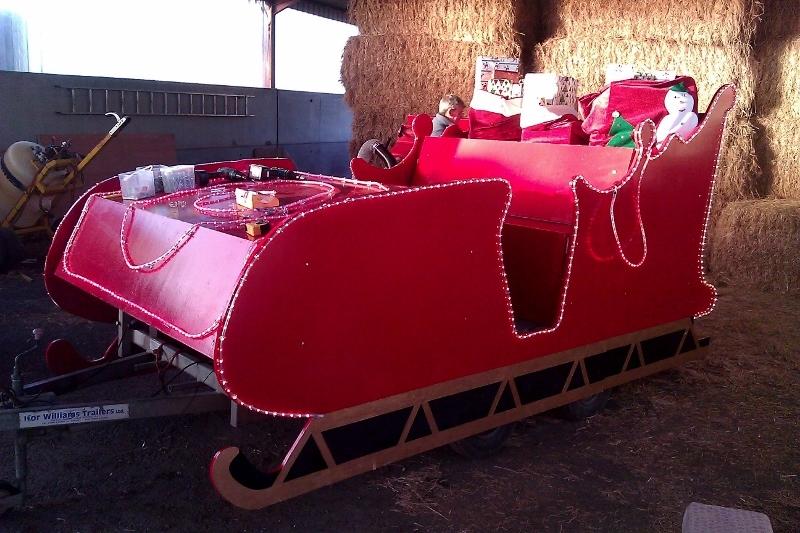 It’s a large undertaking for our Rotary club, from designing and building the sleigh and planning the routes, through finding enough volunteers each year to deliver flyers and take the sleigh around the streets. We would always welcome volunteers to help us each year. 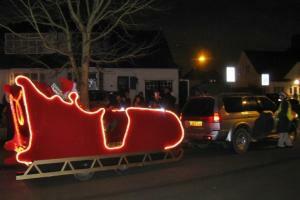 Our Sleigh routes are very carefully selected and are reviewed each year. 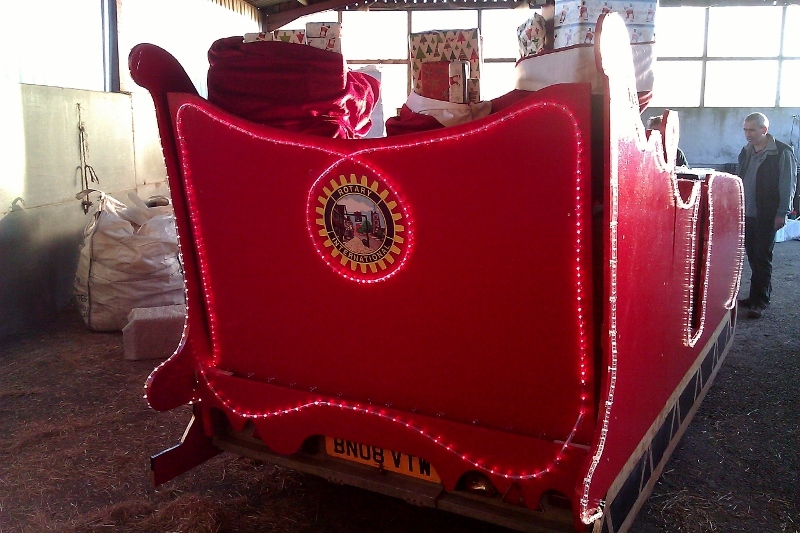 Our overriding concern is to ensure the sleigh can travel safely. So, we consider a number of issues such as the width of streets and the number of parked cars – so we can manoeuvre the sleigh – and wherever possible we avoid bus routes or main roads. It’s also important to limit how far Santa’s helpers have to walk during the evening’s trip. 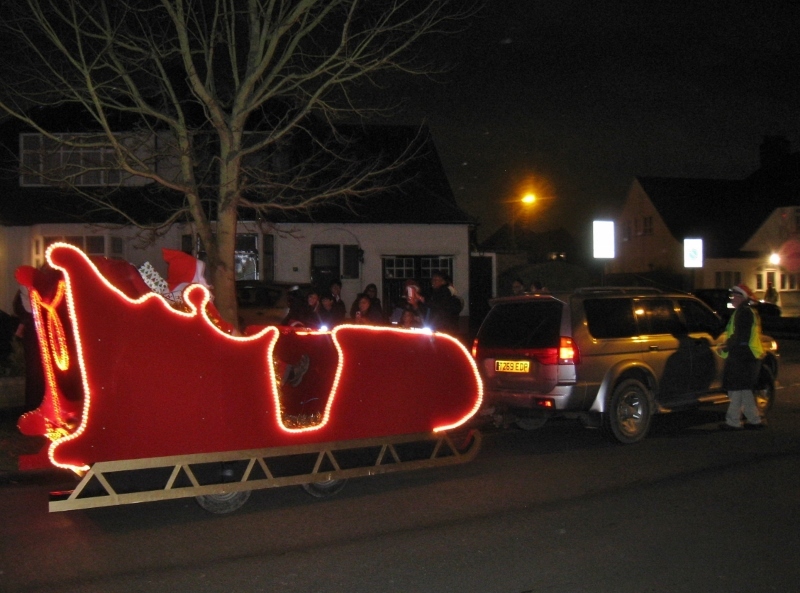 Each year since we started Santa’s Sleigh, residents have contacted us asking if Santa can visit their road or can we offer sleigh rides, or can they book Santa’s Sleigh for private events or can we take our sleigh to other towns! Sadly, we can’t consider most of these requests. We just try to visit as many streets as we can in the weeks leading up to Christmas as we know it brings a lot of happiness to the children of Pinner. 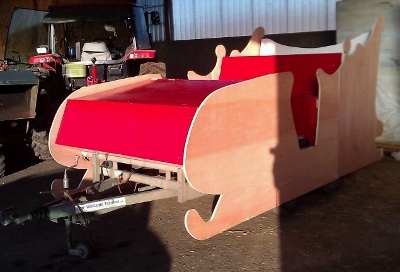 Creating a brand new sleigh proved to be an exciting challenge for a group of enthusiastic Pinner Rotarians, ably directed by our structural engineer Jez. 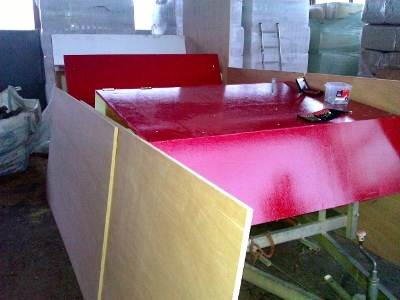 The early stages involved a lot of red paint - and not just on the sleigh! 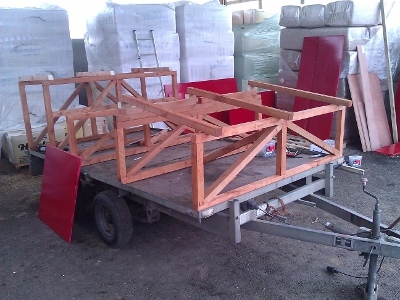 But finally the end product emerged and was much admired as it toured the streets for the first time. Out on the road at last! 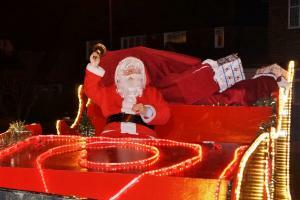 Santa and his big red sleigh toured the streets of Pinner on various nights from 13th to 21st December.